Blizzard has done an amazing job with the Pet Battle system. When the initial news of this feature broke many moons ago I was less than impressed. I have never played Pokemon and did not get the appeal. However as each month passed and more news was released, I turned from a complete cynic to genuine fan of the mechanic. Simply put, the pet battle system is well implemented and much more addictive than I thought possible. 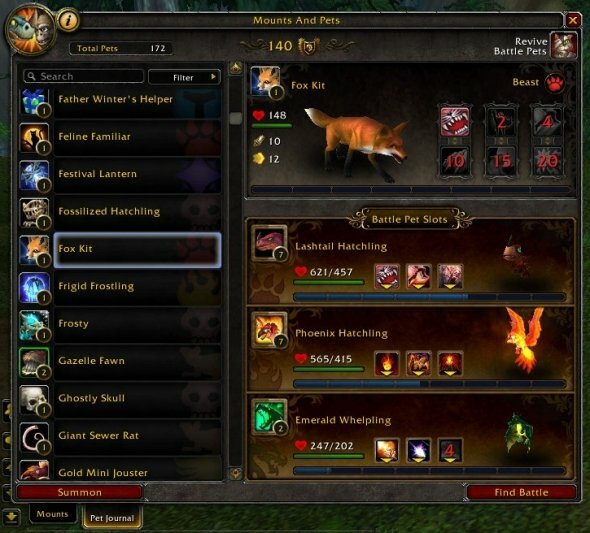 Call it a Food for the Gods preview for episode 55 of the podcast, but Blizzard must implement a sort feature in the Pet Battle menu and they must do it ASAP. With over 400 pets and sure to grow, the idea of not having a sort function in the pet selection window is actually mind boggling. And while we are asking for change, how about you give us the potential to create teams and select them from a drop down, again something that seems like a no brainer. Have a different opinion or agree? Let us know with a comment below! This entry was posted on October 25, 2012 at 10:53 pm and is filed under General, HFL, MMO, Podcast, World of Warcraft with tags Blizzard, Games, mists of pandaria, MMO, pet battles, Podcast, Role Playing, RPG, Warcraft Cataclysm Raids, World of Warcraft. You can follow any responses to this entry through the RSS 2.0 feed. You can leave a response, or trackback from your own site. There is an ability to filter pets by type, and the ability to search by name. But it would be really nice to be able to sort your pets by level, which is not available now. And filtering pets by type is clunky compared to the ability to sort pets by type. Also, the way mounts are sorted keeps changing. Usually they’re all in alphabetical order, but sometimes they are sorted by type (hawstriders together, kodos together, etc.) I’d love to be able to search my mounts the way I can search my pets (I’ve got 80 after all), or sort them by color or by type. If you go to Disneyland and you just want to ride coasters, that’s fine! Just ride coasters…no one is forcing you to ride rides in Fantasyland nor are you having any less of a good time on coasters than those who ARE spending their day with their kids in Fantasyland. An experience in either, WoW or Disneyland, truly is a “one-size-fits-all”, because of the variety of what is offered. The more variety the better. You don’t have to go on every ride in Disneyland to have a blast and get your money’s worth, and you don’t have to play every aspect of WoW to get your money’s worth. GREAT podcast! Thanks for your time.